I do workshops, science shows and longer projects designed for specific groups of children. 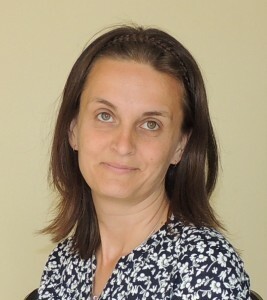 I work with both mainstream pupils and children with Special Educational Needs. I also do some science writing for adults. Most of my work is with primary school children (age 4-11). Small children are scientists. Even before they can move they are exploring the world by putting things into their mouths. Then, when they move, they poke their fingers into everything. Next a pointing finger appears and is accompanied by a grunt which is their way of asking ‘What is this?’. By the time they can speak they are accomplished Principal Investigators in their own world. The ‘why?’, ‘what?’ and ‘how?’ questions are just a natural progression. If the questions get answers, they will stay curious and keep asking them. If we ignore them, the curiosity slowly dims. These observations are based on my own children; Matilda (7), Joe (5) and Archie (4). When my daughter started school it seemed natural to offer the teachers some growing projects (my background is in botany). One year we grew sunflowers and then the class grew a loaf of bread from seed. The children loved the sense of achievement that both of these projects gave them. The school then asked me to become Associate Governor for Science and I also became a STEM Ambassador as a way of formalising this voluntary work. It is just so fantastically rewarding. In one of my first sessions I had a ten-year-old pupil who was initially unimpressed at having to make paper trees to withstand a ‘hurricane’. However, she listened to my introduction about what happens in nature, incorporated that into her paper tree and built one of the best trees in the whole session. At the end she said ‘I love it when we don’t do work!’ and was beaming as she left the room. I also work with a Special Needs school where the children have a huge range of abilities. We have recently been doing Sensory Science. In one session I froze water into lots of different jelly moulds, bottles and bowls and we mixed these up with hot water bottles and buckets of warm water. Each child explored the activity in their own way. One child liked to stroke the ice as it melted, another liked to catch the ice cubes in a plant pot as the water drained away and a third child was delighted when she was allowed to smash the ice out of a plastic bottle. We did counting and discussed temperature and sizes all as a natural part of conversation. The feedback from the school has been fantastic; apparently science has always been their worst subject but it is now climbing up the subject list. How do you tailor science education to special needs children? I start by going into one of their normal science classes so I can meet the children and teaching staff. It gives me a great insight into how they will react to what I have planned. I need to know how they will react to things such as loud noises, music, furry objects and different light levels. I need to be sure I can engage them, not scare them! It also gives me clues to their dexterity and concentration spans so I can modify my plans accordingly. My aim is to get them exploring an activity and using language or signs to describe what is happening. We use all our senses and talk about size, temperature, light and feel. We use numbers and countdowns at every opportunity. How do you work with special needs children when all of them are so different in their needs? My Key Stage 1 (age 5-7) SEN classes only have about six children and three or four adults depending on the specific needs of the children. The school staff know which aspect of an activity is most likely to engage each child and generally encourage the child to explore that first. I follow each child’s lead and expand with what I think they are likely to enjoy next. My method is best explained with an example such as our session on air. We started with some Balloon-CD hovercraft were a huge hit until one child tested them to destruction! Then we moved to blowing up balloons and letting them go again, feeling the air rush out, listening to the sounds and watching them sail through the air. I had also made some sail powered cars which were disappointing because too few of the children had the dexterity to work them, so we just moved on. Next we blew lots of bubbles and chased them round the courtyard. The final activity was the biggest hit – an air rocket. The children were initially worried by it but as soon as their teachers had a go they joined in with the cheering and countdowns to launch. They were great at taking turns and collecting up the rockets. Some of them were able to relate stamping on the launch pad to the height the rocket achieved and even how to aim the rocket either high or far. One child in a wheelchair was delighted to have his carer stamp his front wheel on the launch pad and another child had to be lifted into the air to produce enough force for launch but they all cheered and came back for more. Some of the children were delighted to feel the air from the pump on their faces, but others were not. Each session is a learning opportunity for me too! Is it sometimes very difficult to communicate with special needs children? The teachers and support staff know how to communicate with each child. I take their lead and we generally use some basic signs, lots of facial expression and huge amounts of praise for all scientific observations. Their teachers spend part of the session observing the children and noting down their progress so they can monitor it over time. Most of the children are so excited to have something so different to their normal day that they don’t need much encouragement. The teachers suggested I repeated some of the favourite exercises and we noticed that the children started by repeating what they had before and then expanded into new skills or words. It is so rewarding to watch their confidence and abilities grow. What has been the most challenging lesson you’ve had with special needs children? I haven’t really had any yet. The teaching staff have been great at helping each child to get the most from the sessions. You interviewed one of my ex-tutors, Dr George McGavin, and he said ‘If you can get the fire going in an 8 year old, it will blaze away for the rest of their lives.’ He is so right! I really want to keep that innate spark of curiosity alight. It’s so easy to maintain it but so hard to re-ignite when it goes out. I genuinely believe that we can turn around the decline in scientific subjects by working with younger children. It is hard to convince funders to invest because there is such a long lead-time before any measurable increase in uptake will be seen. Primary school science is comparable to blue-skies research; there is no immediate profit. I’ve toyed with the expression ‘rainbow-skies funding’ for primary school science but however you describe it, it needs serious consideration. We need to create a more scientifically literate society, better equipped to question research in a rational fashion. If this happens there should be fewer knee-jerk reactions to scientific reports, especially amongst politicians. I get to share my love of science with a wonderfully receptive audience. One of the five-year-olds requested a labcoat in his letter to Father Christmas last year. How cool is that? That is a hard question. I love them all! 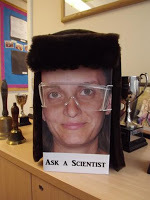 My favourite project with the children is ‘Ask A Scientist’. They can ask me anything on any STEM+M subject. They write it down and put it in the question box (which looks like my head) where I have a think about it then design a demo to explain it. The questioner becomes The Scientist to explain the answer to their classmates. There are a huge range of questions but we have mixed bogeys, made intestines, used a whole class to demonstrate seismic waves and dressed up as Neanderthals and superheroes. It can get quite silly but the children and their teachers love it. They remember lots of the information too. I use demonstrations which employ materials from around the home. It needs to be super-accessible so they realise how easy it is to be a scientist (and how much fun it can be). It’s a case of Do Try This At Home (albeit in the garden). On a different note, I was quite surprised by my own reaction to taking part in Science ShowOff recently. It’s an ‘open mic for all communicators of science’ where you get nine minutes to talk about your subject. Most of my fellow Showoffs talked entertainingly about proper research, we had a song about Pluto (Phil Dooley), Sarah Cosgriff dressed as a sumo wrestler and Lucy Rogers describing what happens to your body in space. I stood up and put a mixture of porridge and coffee into a pair of tights to replicate the intestines and ended with defacation live on stage. It went down pretty well with a Friday night crowd and I was left buzzing for hours! There are two great projects coming up in the autumn. I have been working with a class of children on a project called ‘Growing A Loaf’. The five and six-year-olds sowed wheat seed in a corner of the playground and watered, weeded and nurtured it to a beautiful crop of strong plants. We got some interest from BBC Radio 4 Farming Today who came out and recorded with the children, Charlotte Smith was fantastic with them and they all chatted really confidently about their crop. The story was then picked up by BBC Radio Oxford and BBC South Today television. The children were recorded during the summer and again as they threshed and winnowed the crop by hand. South Today also came to Mapledurham Watermill to see the grain being milled. 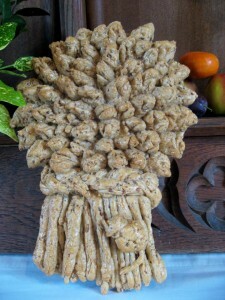 The children are going to work with Helen Hales, their fabulously talented teaching assistant, to create a wheatsheaf shaped loaf from their flour. This will be presented to the vicar at the school harvest festival in the village church and South Today will be recording them do it all. The whole story will be broadcast in mid-late October and I can’t wait to see the results. The children have worked so hard and have amazed everyone by confidently explaining their work to the journalists. It has been an enormous boost for the whole school. I am also delighted that I have been asked to be a judge at the Stemettes Oxford Hackathon. It’s a free event for girls and women aged 7-21. They will learn how to code and create an infographic from scratch. Details are here. Most people say you should stick with your research, become a STEM Ambassador and keep practicing your skills. They are absolutely right. It is possible to do it outside research but it is harder unless you network like crazy. My advice would be the same as for researchers; become a STEM Ambassador because you get some training, lots of fantastic support and even suggestions for activities until you get more confident. Remember to listen to feedback and don’t give up! You can follow Sarah on Twitter at @SarahBearchell or see what she’s up to on her website.